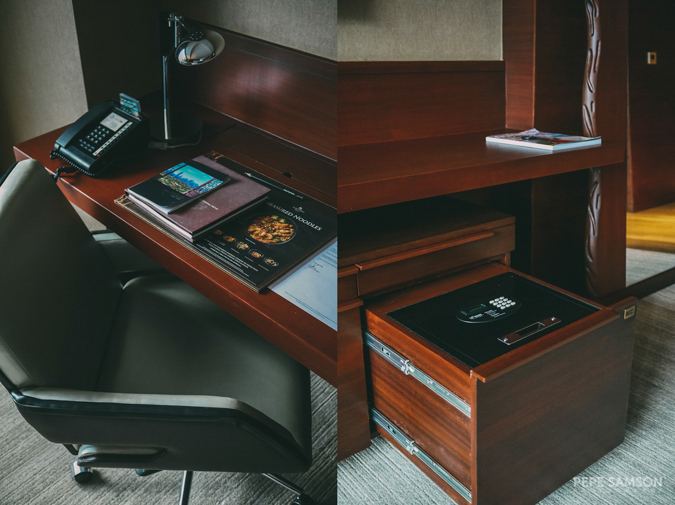 Nestled within Pasig City’s premier business district, Marco Polo Ortigas seamlessly blends work and play for discerning travelers and “staycationers”. 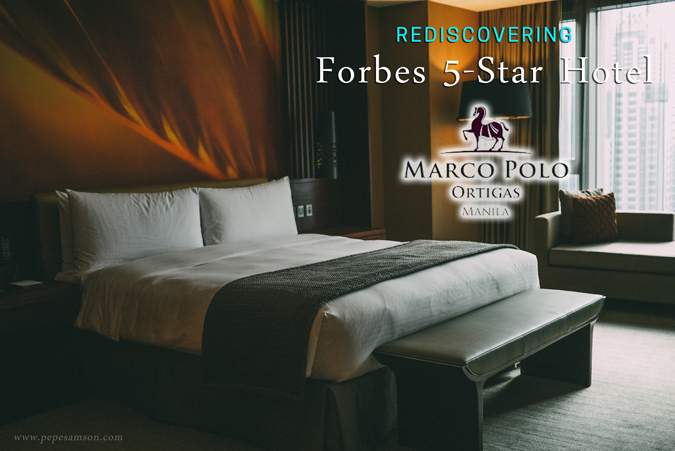 The 3-year-old property has quickly propelled itself into the forefront of hospitality in this side of the metro—in fact, it earned a prestigious 5-Star rating from Forbes Travel Guide early this year, the second hotel in the Philippines to ever receive that recognition since 1958. 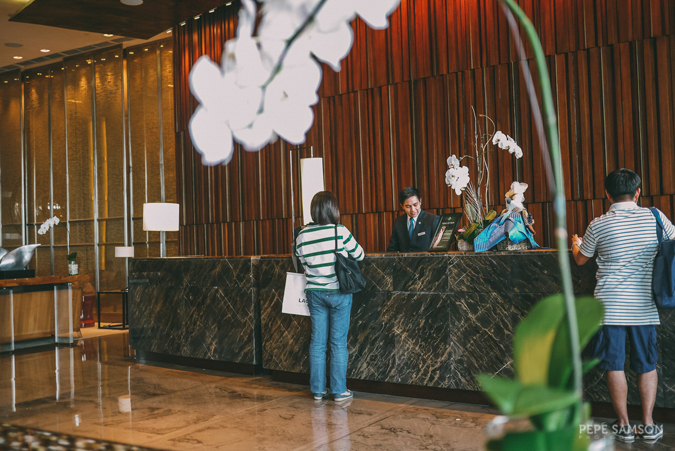 With its luxurious amenities, elegant aesthetics, and excellent service, it’s no wonder that it passed the stringent standards of what is considered as the Olympics of the hotel industry. I was invited recently to revisit the property and I’m happy to report that my recent staycation was just as amazing as my first one last 2015—if not even better. 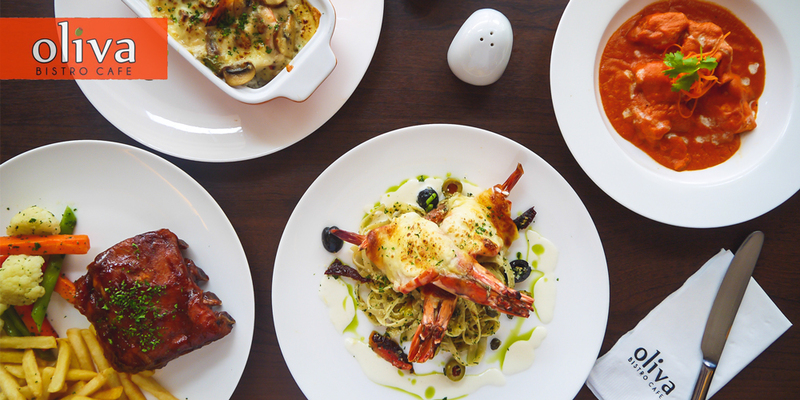 Marco Polo Ortigas continues to deliver genuine hospitality alongside a host of delicious dining options that families and couples would surely love. 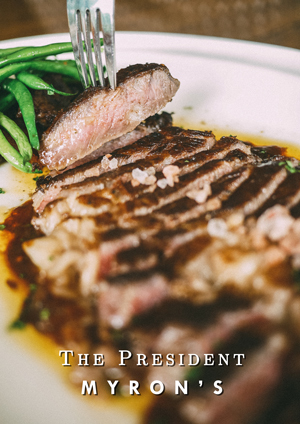 Keep reading below to find out more about my memorable 5-star stay. 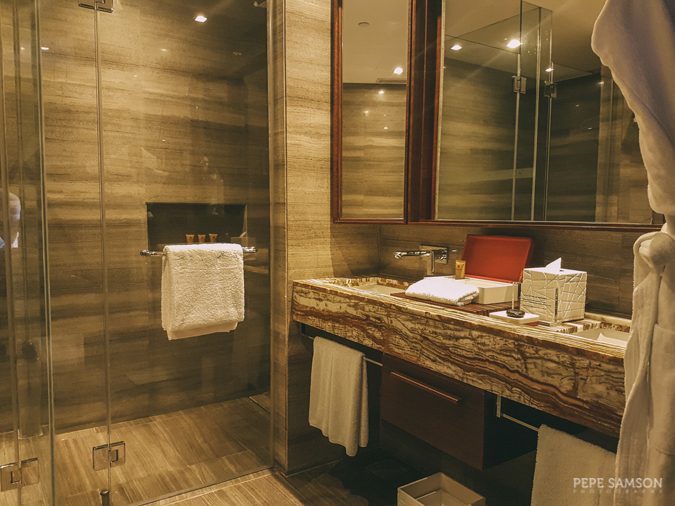 Marco Polo Ortigas features a total of 316 well-appointed rooms and suites—one category of which is the Premier Room (check rates here), a 60 sqm. 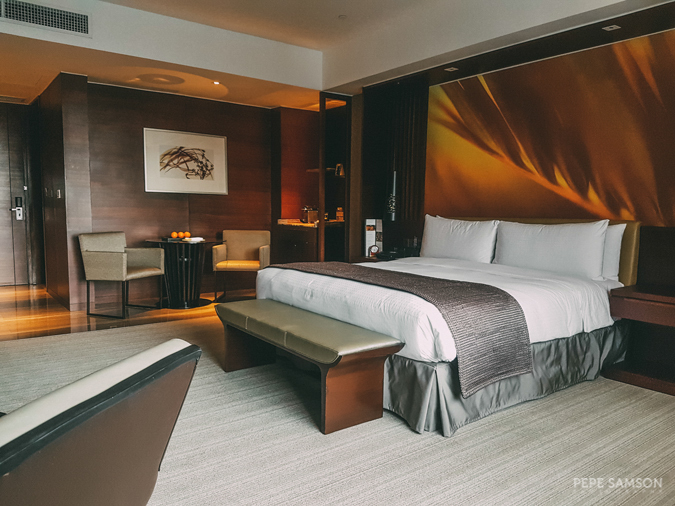 corner room equipped with a King-sized bed and a spacious en suite bathroom, and offering a spectacular city view. This was where we stayed. 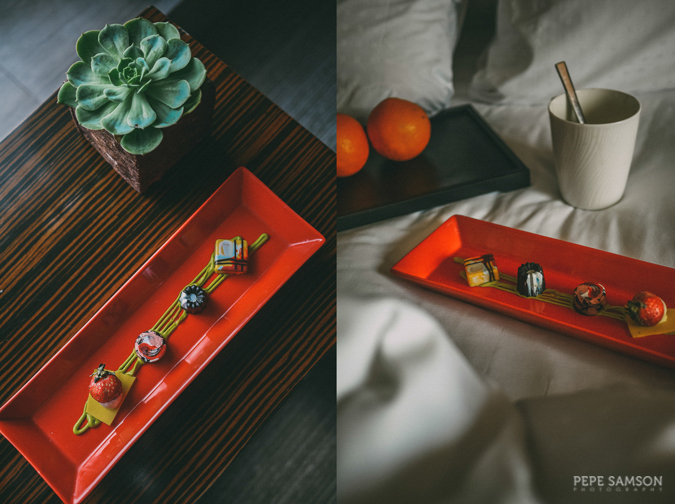 Welcome treats were waiting for us upon arrival: delicious chocolate pralines from the hotel’s in-house café downstairs, the Café Pronto. The bed was large and I really loved the fiery color scheme of this one (the one I have stayed in before, the Superior Room, had green tones). 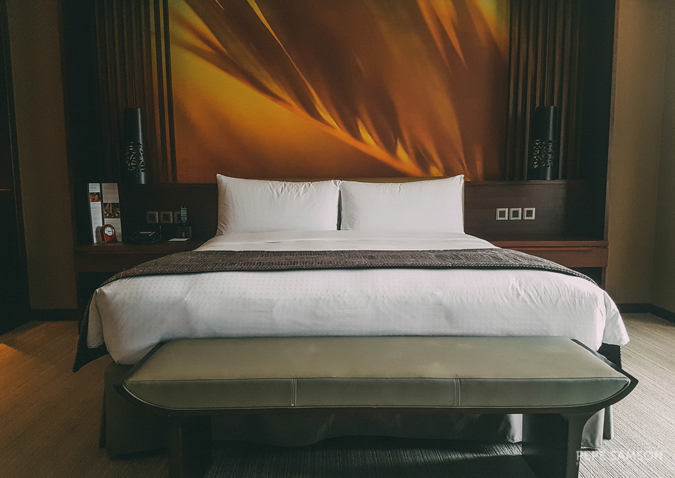 We couldn’t wait to relax in this incredibly spacious room and enjoy the hotel facilities such as the gym (theirs is one of the best in Manila hotels—looking forward to a quick workout) and the pool. 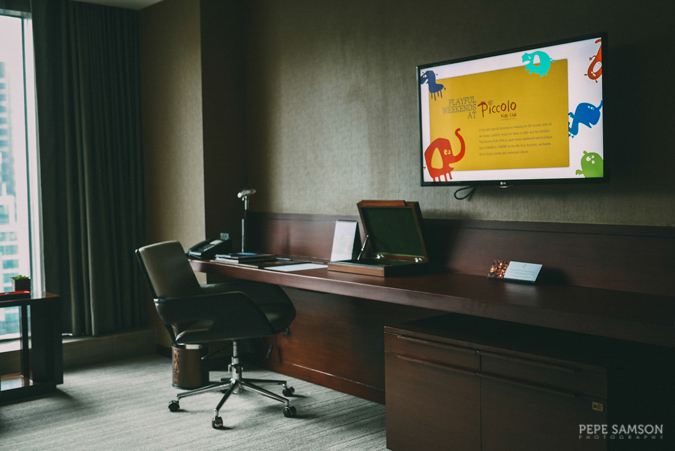 Of course, before heading out to the Connect Lounge for some snacks, we made ourselves some coffee from the Nespresso machine—available, and complimentary, in all room categories. My favorite was the Intenso—strong and bold, perfect with the pralines. 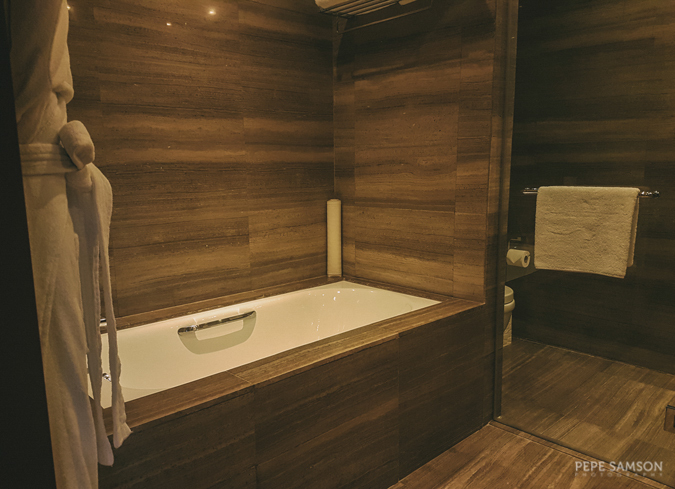 The bathroom was divine—featuring his-and-hers vanities, a walk-in shower, a separate toilet area, and an alcove tub. 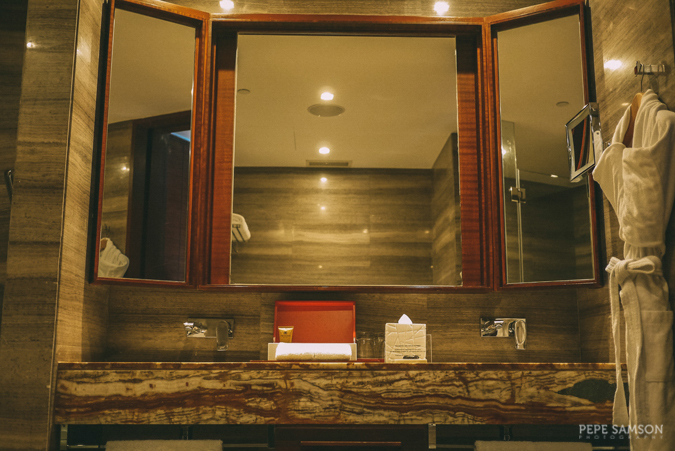 Fresh towels, thick terry robes, custom toiletries, and Trussardi products are available. 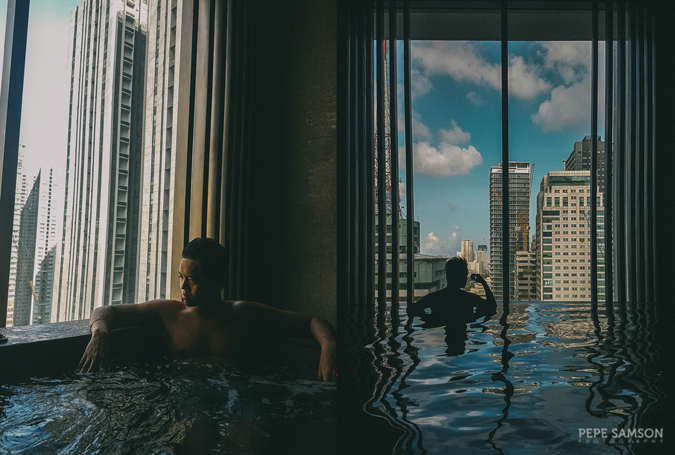 It really makes you feel like you just want to stay in all day, soak in the tub (perhaps with some wine or champagne) or take a long, warm shower. 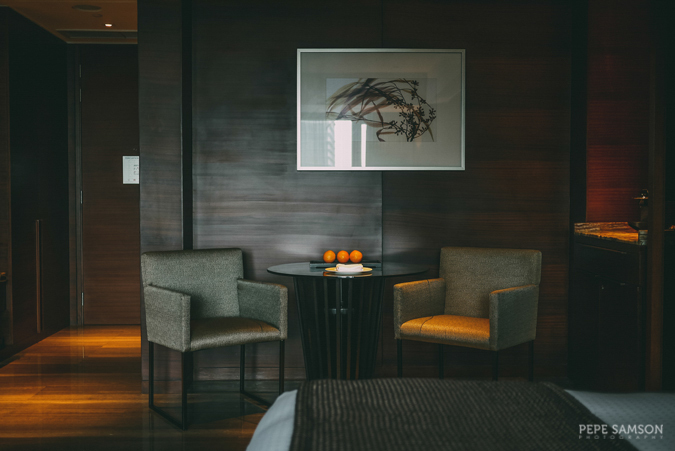 Other features of the room include a mini-bar, an executive desk, a small tea area, and a window-side lounge allowing you to sit and admire the city view. 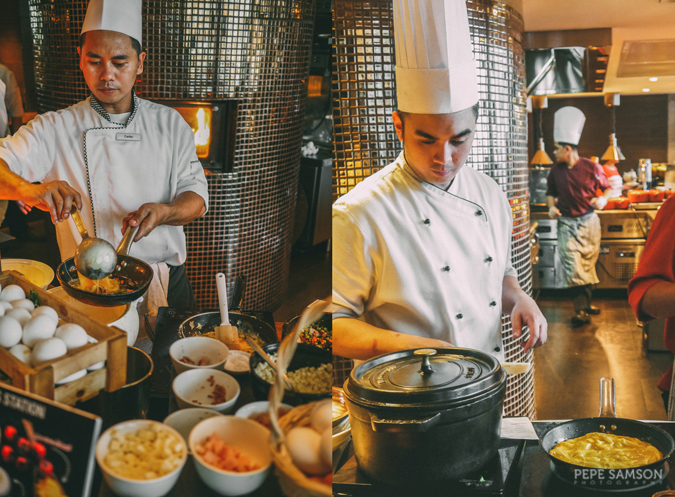 After checking in, we went downstairs to the 24th floor for some afternoon bites at the Connect Lounge, Marco Polo Ortigas’ lobby lounge. 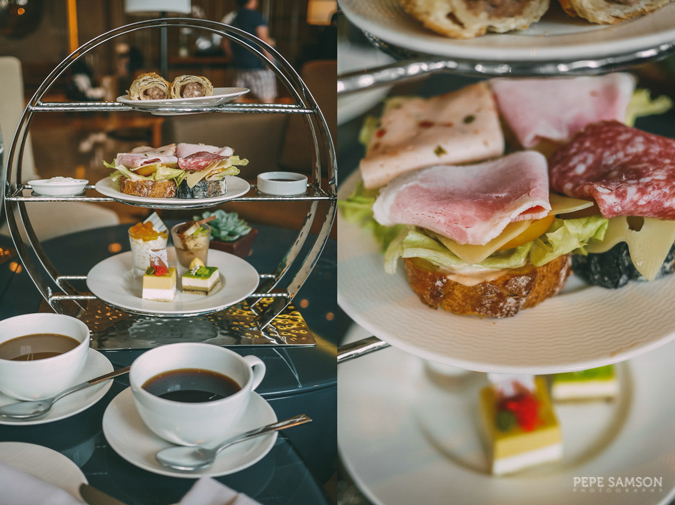 From 2:00PM to 6:00PM, guests can share an Afternoon Tea Set (PhP788) composed of English scones with jam and cream, pastries, finger sandwiches, a selection of desserts, chocolate fondant, and a choice between coffee (single-serve) and tea (one pot). We especially loved the sandwiches piled with fresh greens and delicious cold cuts, assembled on their special flavored baguettes. The intense, rich, and exquisite chocolate fondant was last to be served—a delightful ending, if I may emphasize! 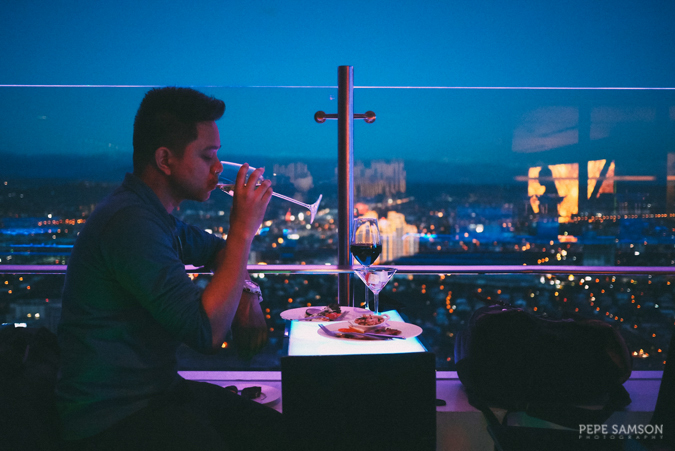 If you seek a more romantic setup for your pre-dinner bites and tipple, head up to VU’s Sky Bar & Lounge on the 45th floor and try their Aperitivo—a small buffet of bite-sized snacks like cold cuts, cheeses, croquettes, salads, breads, and pizzas, alongside a selection of beers and wine. 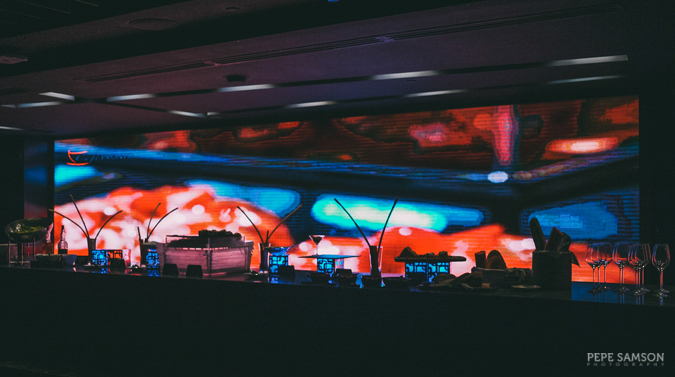 It’s available from 5:00PM to 8:00PM, so whether you just want a light evening meal with some drinks or you’re looking for a pre-dinner venue, VU’s is definitely a great choice. 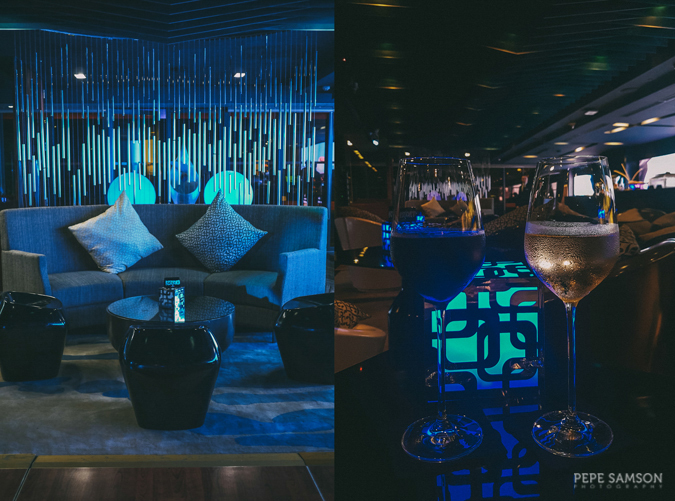 Plus points for the astounding panoramic views as well as the live band playing in the bar. I can’t blame you if you would want to stay all night for some more cocktails. 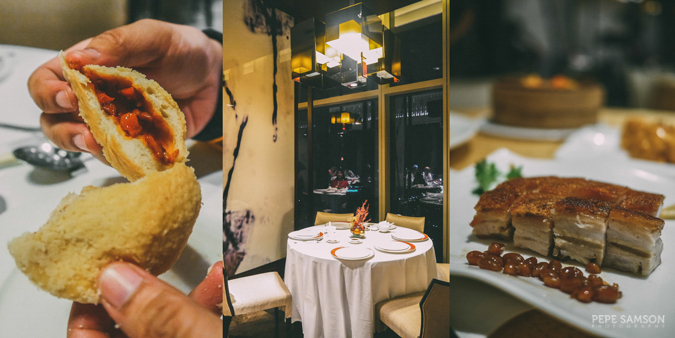 Lung Hin, the hotel’s award-winning Cantonese restaurant (2016 Golden Horse Award), is perfect for lunch or dinner. 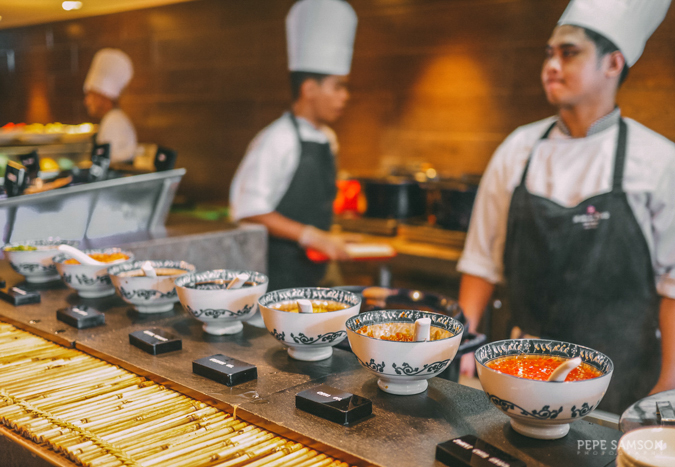 Bring the whole family so you can order a variety and sample more of their amazing dim sum and family-style dishes. 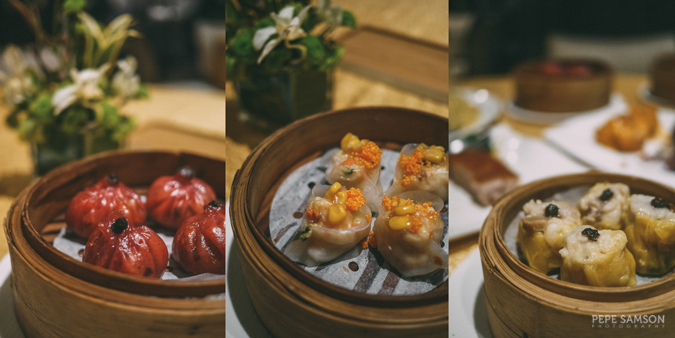 I highly recommend the Pork Siomai in Truffle Sauce, Steamed Scallop Dumplings, Baked Pork BBQ Buns, Steamed Custard Buns, Vegetarian Dumplings, Deep-Fried Beancurd Leek Rolls with XO Sauce, Crystal Prawns, Roasted Pork Belly, Yang Chow, Chilled Avocado Sago, and Yuzu Jelly. I’ll let the photos below do the talking. 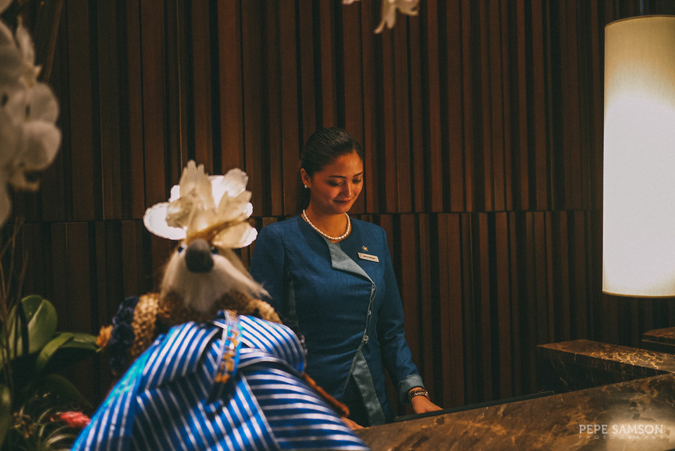 Order Marco Polo’s signature Earl Grape Iced Tea, or pick from their aperitifs. 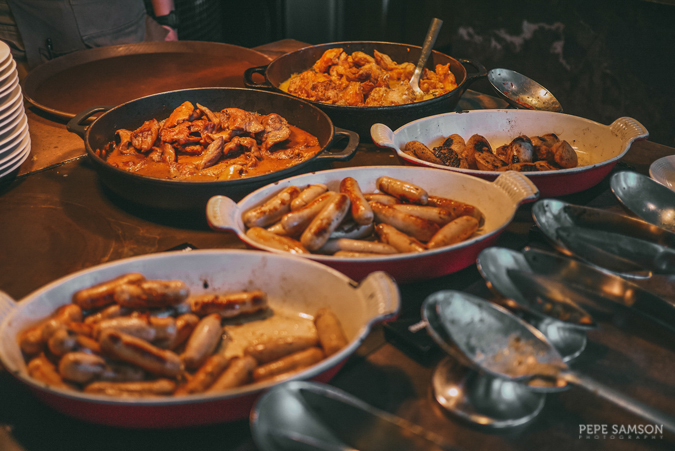 For breakfast, enjoy Cucina’s buffet consisting of international cuisines or enjoy a bit of privacy at the Continental Club (if you’re staying in a room with Continental Club access). 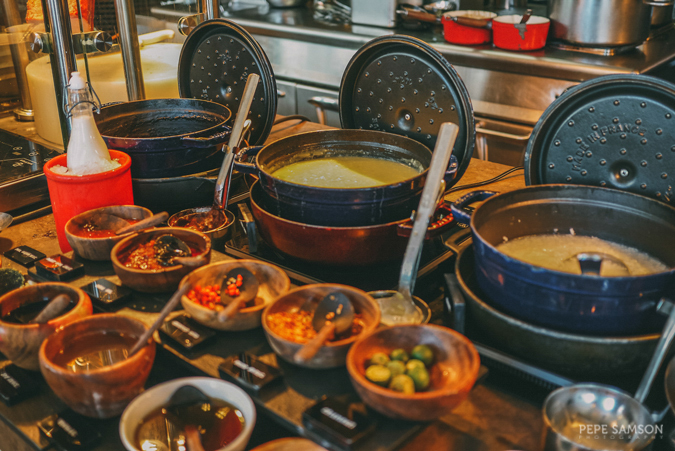 At Cucina, diners can relish American, Japanese, Chinese, Indian, European, and Filipino specialties. I noticed that they have more options now compared to before, and they retained items that diners love. 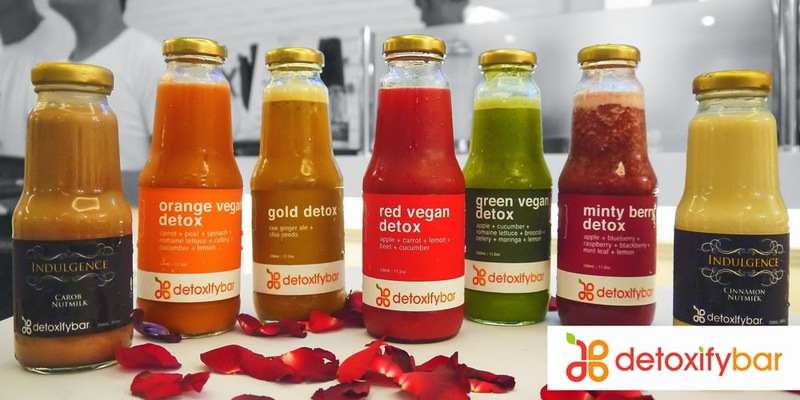 Looking for a quickie snack or some delectable treats for takeaways? 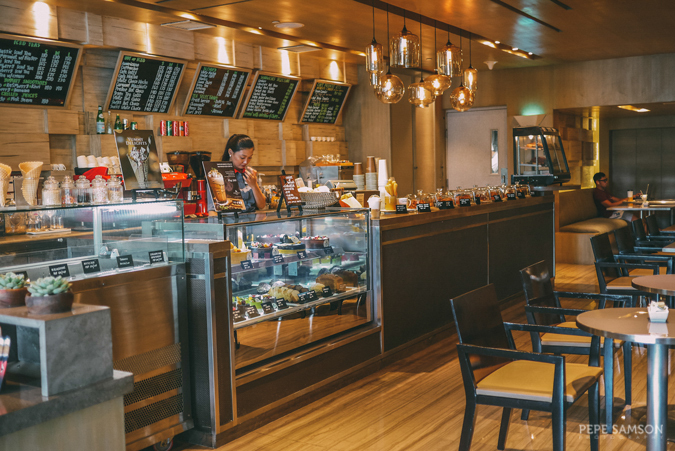 Café Pronto offers a delicious array of pastries, breads, sandwiches, cakes, chocolates, pastas, and salads, as well as specialty coffee, tea, and fruit-based drinks. I loved the banana yogurt smoothie! 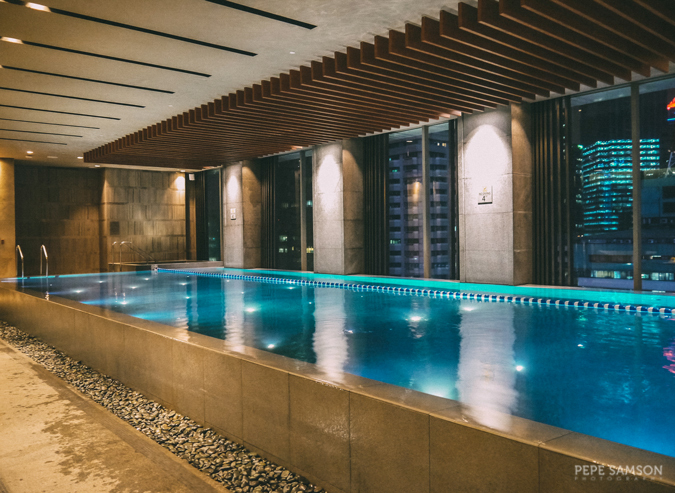 The indoor swimming pool is one of the favorites at Marco Polo, especially among families. A lap pool is built beside a wall of floor-to-ceiling windows, offering a majestic view outside. The nightscape is especially stunning. 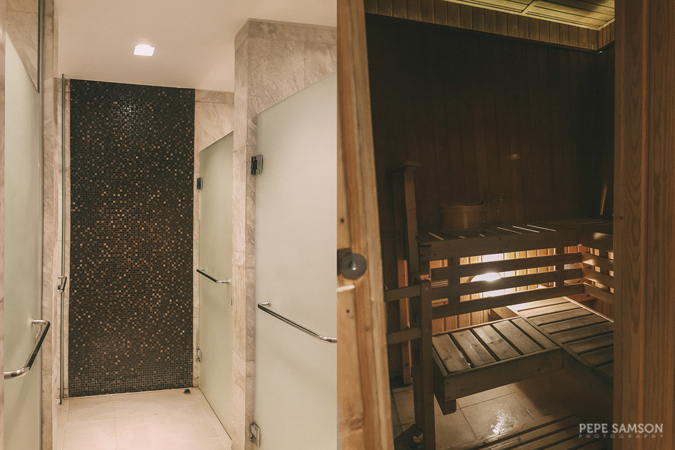 There’s a small Jacuzzi on the far end, and shower areas equipped with steam rooms outside the main pool area. Lemon water is available for refreshment. 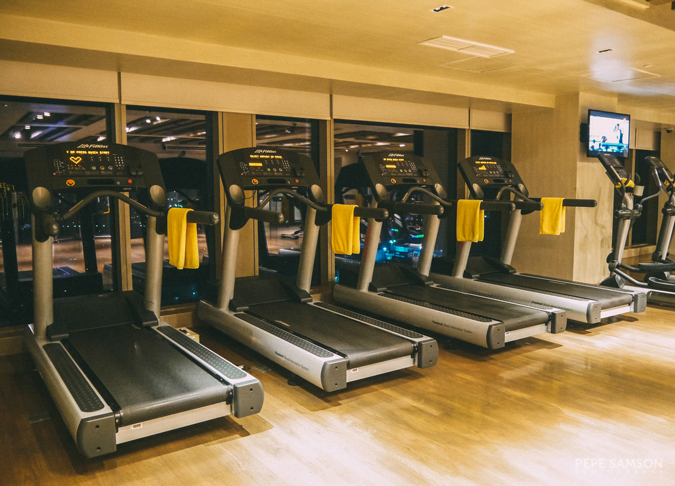 Marco Polo Ortigas has one of the best hotel gyms, featuring state-of-the-art resistance machines, free weights, stability balls, and yoga mats, as well as lockers for your stuff, complimentary water, fresh towels, and free Flow Smoothies until 10:00PM. The gym is open 24 hours, so we went a little past midnight and had it all to ourselves! 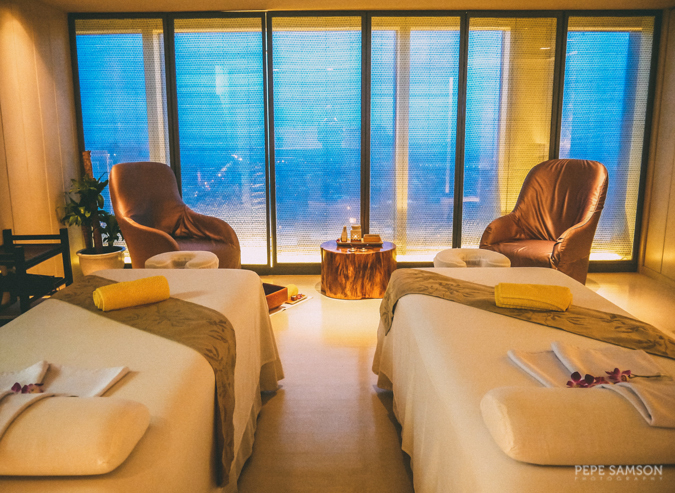 For the ultimate pampering, book a luxurious massage treatment at Flow Spa. 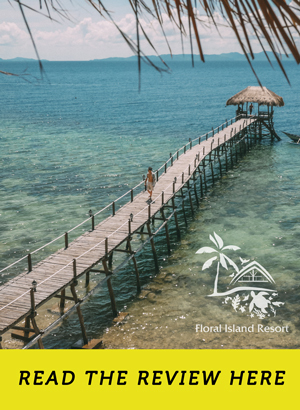 They offer a wide selection of services, but I must recommend the Signature Flow Massage (PhP3,300 for 90 minutes), a combination of Swedish and Shiatsu techniques, Thai stretching, and Hawaiian Lomi-Lomi. My massage here was the Top 2 among all my spa experiences. 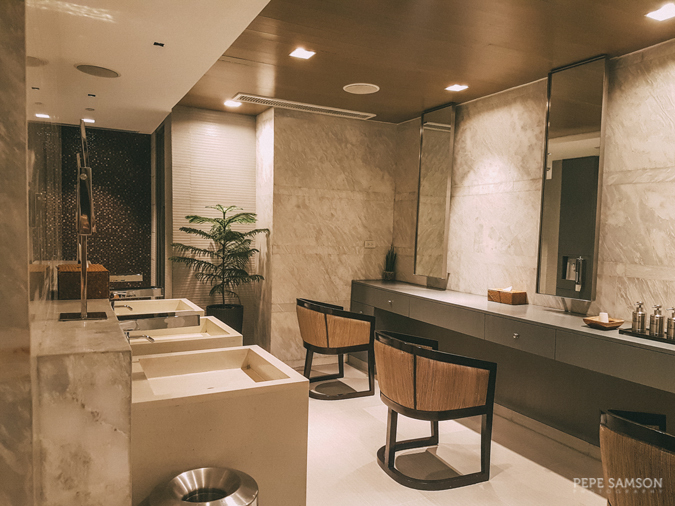 Marco Polo Ortigas boasts of an excellent location—near business, commercial, and entertainment hubs. 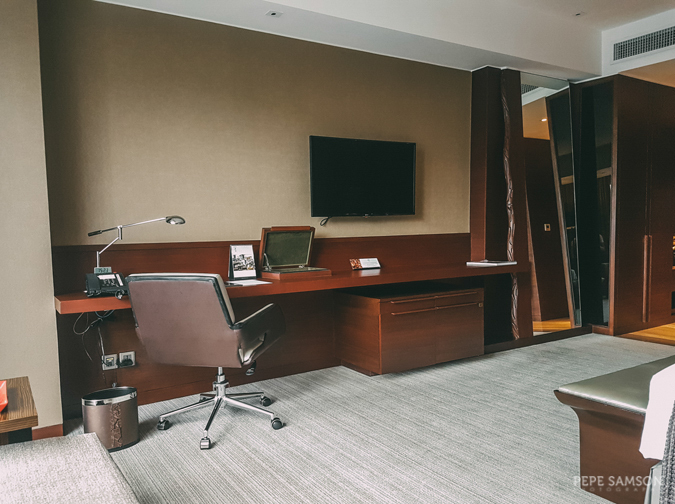 Nearby offices looking to host their foreign guests, families eager for a weekend bonding time, and couples wanting an intimate retreat will never run out of options, be it for their gastronomic hunts, sudden urge for some retail therapy, or other emergency needs. 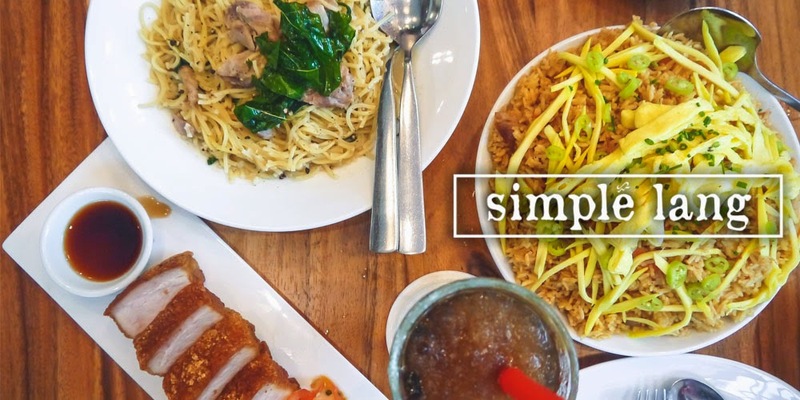 Malls like Robinson’s Galleria, SM Megamall, The Podium, Estancia, and newly opened Ayala Malls The 30th are just nearby, providing everything from the essentials to plain entertainment. 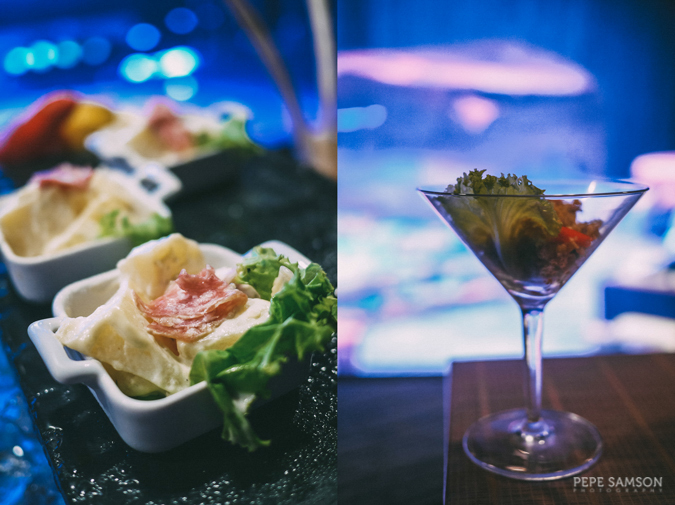 Lifestyle hubs like The Sapphire Bloc and Metrowalk offer more dining and drinking options. 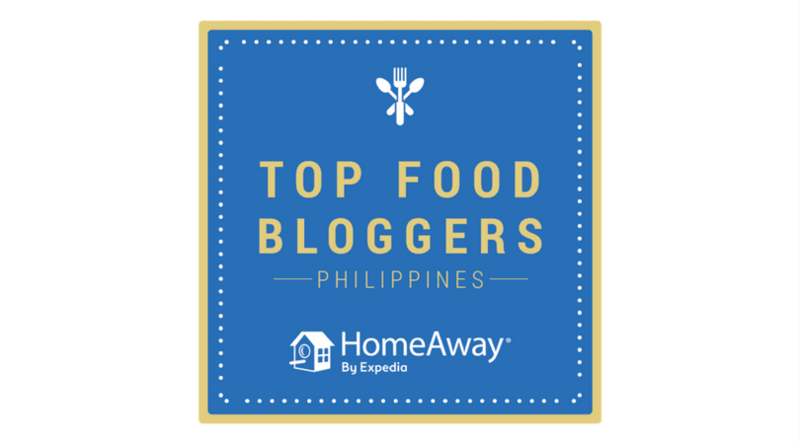 I recommend Sobremesa for South American food, Gino’s Brick Oven or Mama Lou’s Kitchen for Italian, Borough for American food, Tori Ichi and Minami Saki for Japanese, and Bistro United and Locavore for Filipino. 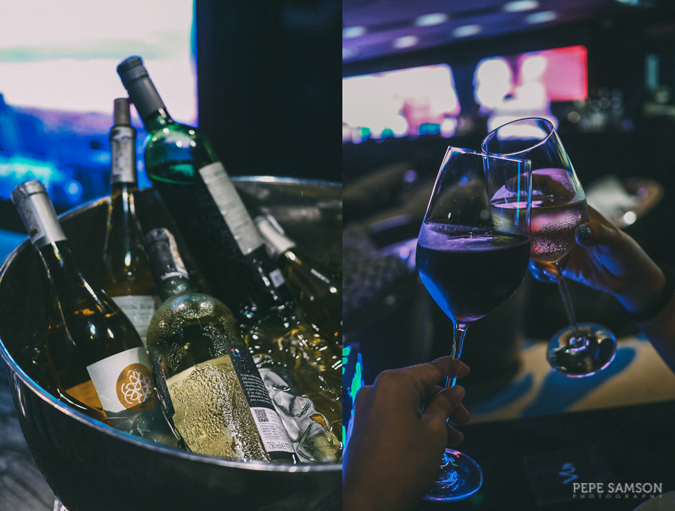 For drinks, head over to Moonshine Pub, Barcino, Black Olive Cerveseria, or Tipsy Pig. Banks, convenience stores, pharmacies, and a hospital (Medical City) are also nearby. For those seeking to brush up on history and culture, the Lopez Museum is a short distance away. Needing some fresh air? Jog around the Ortigas Park. 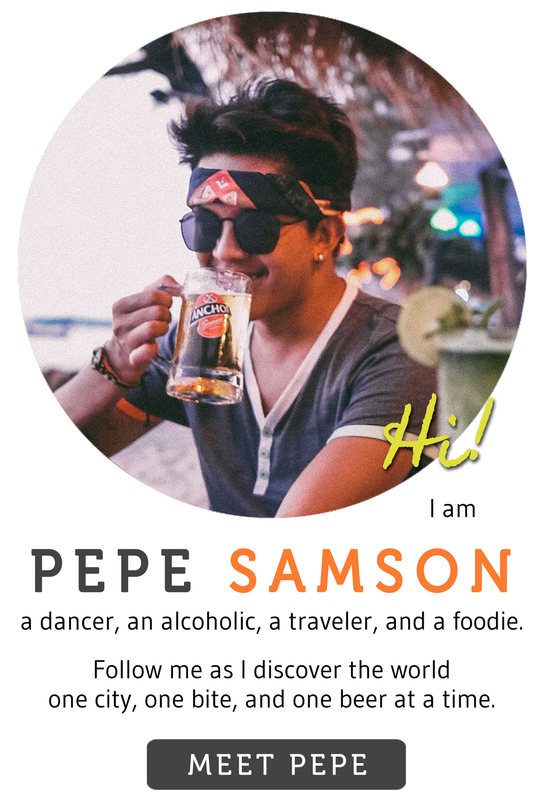 Looking for something you haven’t done before? 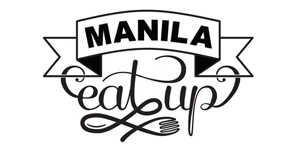 Test your problem solving skills at Mystery Manila. 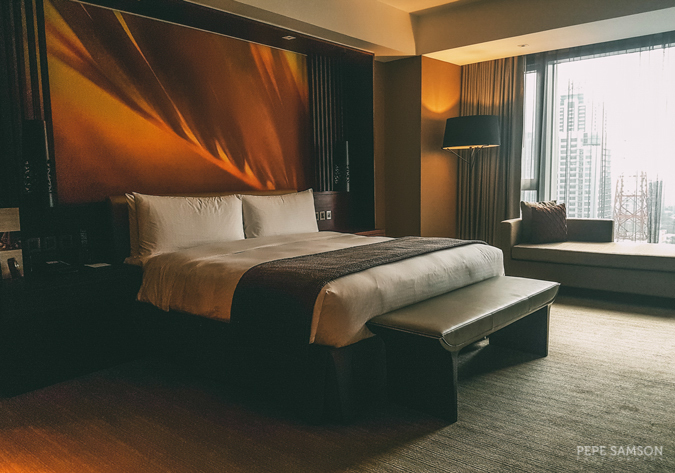 I’ve said it before and I will say it again: Marco Polo Ortigas is a vibrant hotel standing tall amidst the equally energetic city. 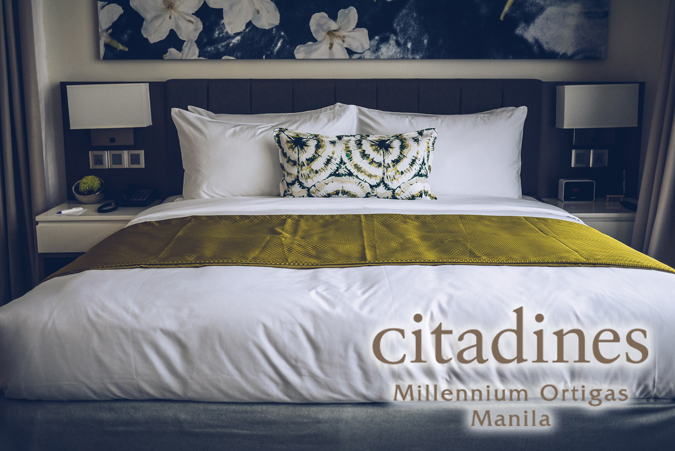 Moreover, it’s an urban sanctuary with lavish accommodations, great service, good location, and exciting dining options—truly an oasis of refined elegance in Pasig City. I’m looking forward to staying here again. 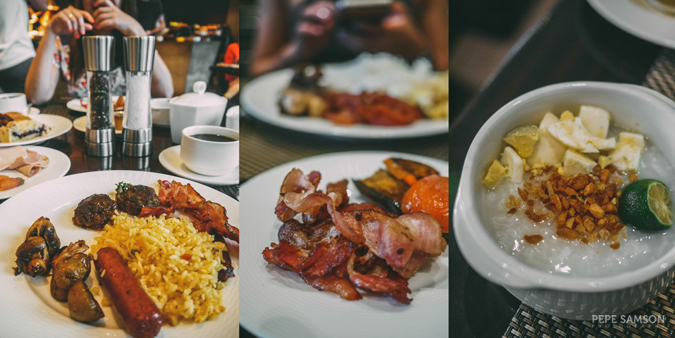 Check out my previous review of Marco Polo Ortigas here. 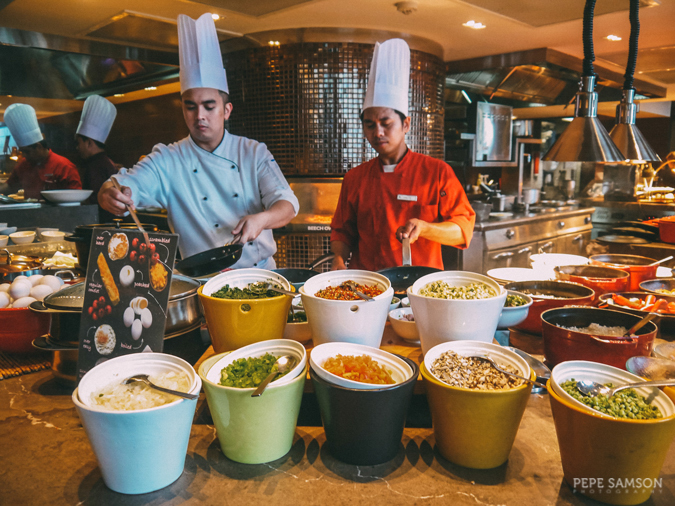 What do you think of Marco Polo Ortigas? 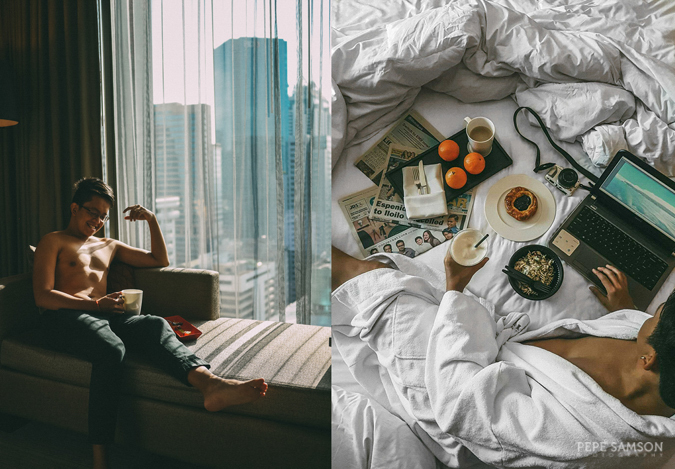 Which is your favorite hotel in Manila?